American Golden-Plovers nest across the American arctic from Baffin Island, Canada, to the eastern edge of Siberia. They winter in the grasslands of central and southern South America making their migration is one of the longest of any shorebird. Their migration takes them through the eastern two-thirds of North America where they are more likely to stop in Tennessee on their way north than on their return trip in the fall. Description: The face, neck, breast, and belly of the adult breeding male plumage is solid black. A bright white stripe separates the black throat and face from the back and wings, which are golden colored with black barring. The adult breeding female is similar to male, but with less well defined head and neck stripe, and more white in the black underparts. In spring, migrating birds may still be mostly in winter plumage and can appear gray. In flight, underwing is gray. Nonbreeding plumage is mostly gray with some mottling but no distinct patterns in the body plumage, though the stripe over the eye is bright. In fall migration, adults may retain partial or nearly full breeding plumage. Juvenile plumage is similar to nonbreeding adult. Voice: Flight call is a sad-sounding queedle. 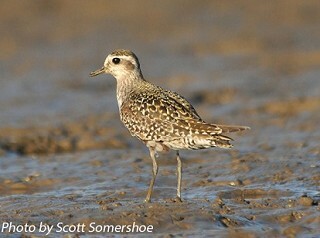 Black-bellied Plover is larger, with a larger bill, and has white rump, white stripe in wing, and dark armpits in all plumages. In breeding plumage back is gray and black, not golden, and black extends only to belly, leaving undertail white. Juvenile is similar, but is more gray and less golden (although some can be very yellowish brown), and shows less of a dark cap. Habitat: During migration, American Golden-Plovers will utilize native prairie, pastures, tilled farmland, burned fields, golf courses, airports, mudflats, and shorelines. They frequent plowed fields in spring. Diet: Their diet varies greatly including invertebrates, berries, leaves, and seeds. Nesting and reproduction: The American Golden-Plover has never been recorded nesting in Tennessee. Status in Tennessee: Fairly common spring migrant found from as early as late February through May. They are much less common in fall, but occur from early July through November (rarely). 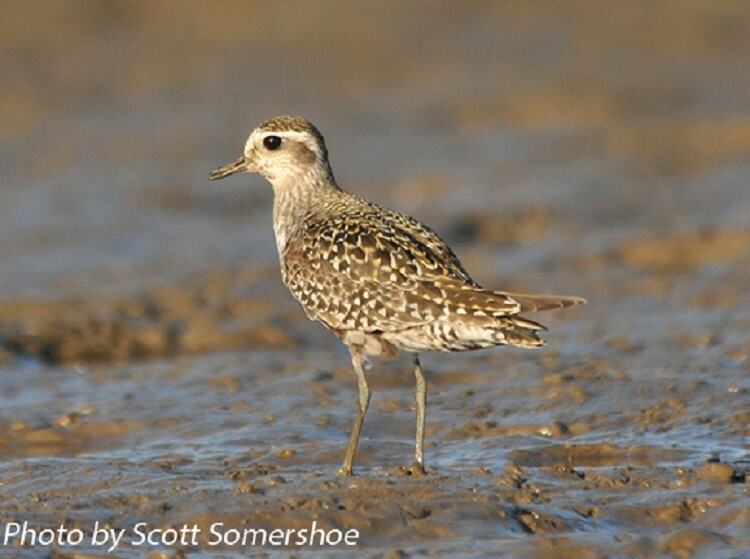 Large groups (>1200 birds) can be found in Tennessee in spring in appropriate habitat, where as the similar Black-bellied Plover rarely occurs in groups over 10-15 individuals. In late March 2009 in eastern Arkansas, birders observed >10,000 American Golden Plovers in one agricultural field, with an additional 8,000 in a nearby field. The global population is estimated to be approximately 150,000 individuals. Considering the observed estimates were conservative, possibly 15% of the entire population of the species occurred in this one relatively small area at one time. The American Golden-Plover has a circular migration route. In the fall, they fly offshore from the East Coast of North America nonstop to South America. In spring, they pass primarily through the middle of North America to reach its Arctic breeding grounds. Adult American Golden-Plovers leave their Arctic breeding grounds in early summer, but juveniles will often not begin migration until late summer or early fall. Some adults arrive on the wintering grounds in southern South America before the last juveniles have left the Arctic. Best places to see in Tennessee: Typically the best places to see American Golden-Plovers are in West Tennessee in March and April in plowed agricultural fields. They can occur anywhere there is suitable open, short grass, plowed fields, mud flats, etc. Abundance is lower in East Tennessee than in West and Middle Tennessee. Johnson, O.W., and P.G. Connors. 1996. American Golden-Plover (Pluvialis dominica), Pacific Golden-Plover (Pluvialis fulva). In The Birds of North America, No. 201-202 (A. Poole and F. Gill, eds.). The Academy of Natural Sciences, Philadelphia, and The American Ornithologists' Union, Washington, D.C.